We have finished at 457 6th Ave ! 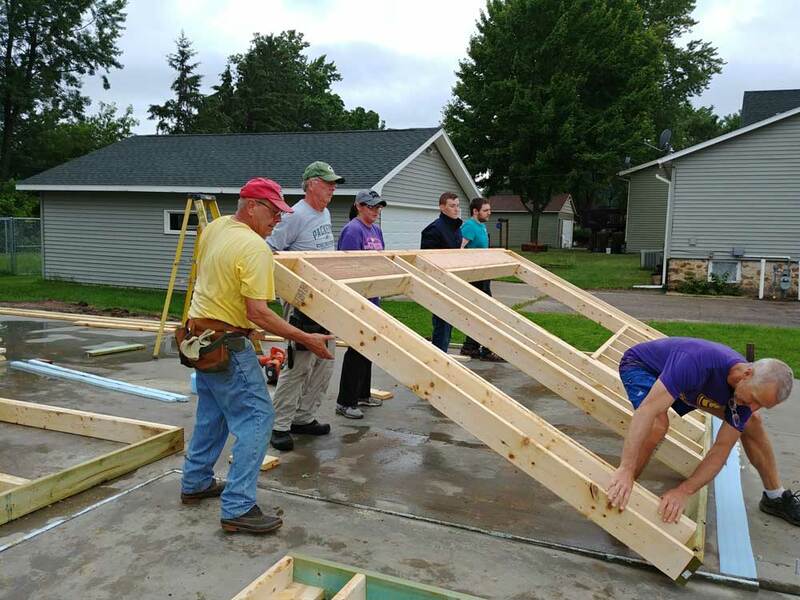 Thank you to all of our volunteers, and to Brian Novotny for leading us on building this home. We will be having a dedication for this home, and the 821 Meadow Street home later this Fall. Please attend either or both! 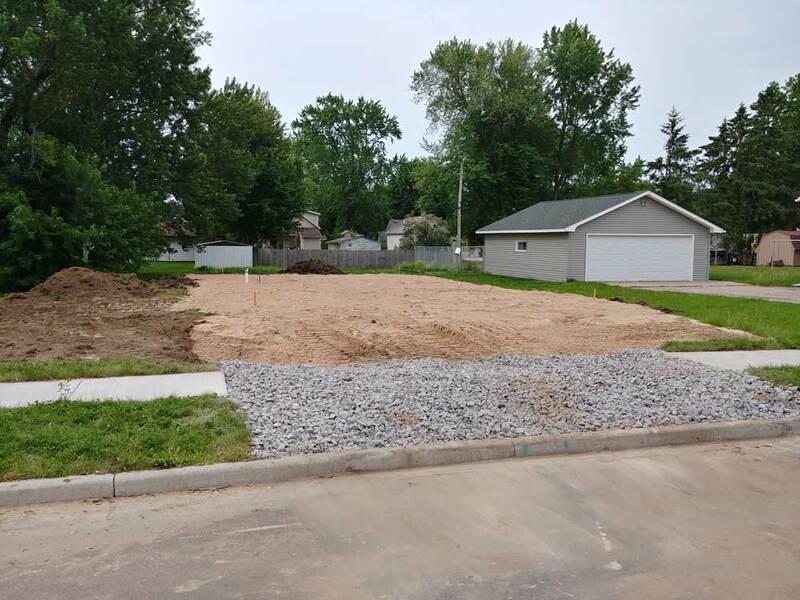 The lot has been stripped, sewer and water has been brought in, and about 600 yards of fill gives us a great start on our next home! 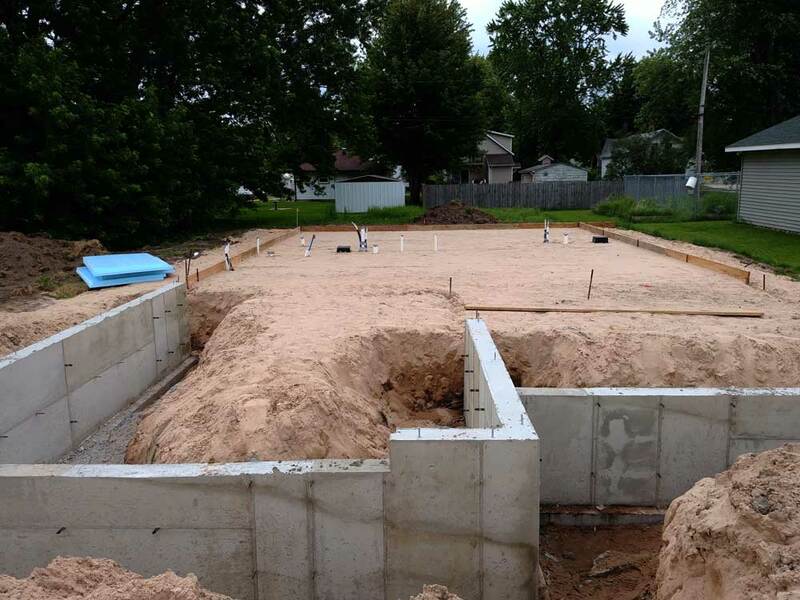 The garage footings have been poured, and the plumber has done the rough in. Next step is getting the foam down that will be under the slab. We will need volunteers this week for that….just not sure what day yet. Then we hope to pour the slab this week and begin framing at 8:00 on Friday June 15th. If you are able to help at anytime on Friday we would appreciate it, thanks. 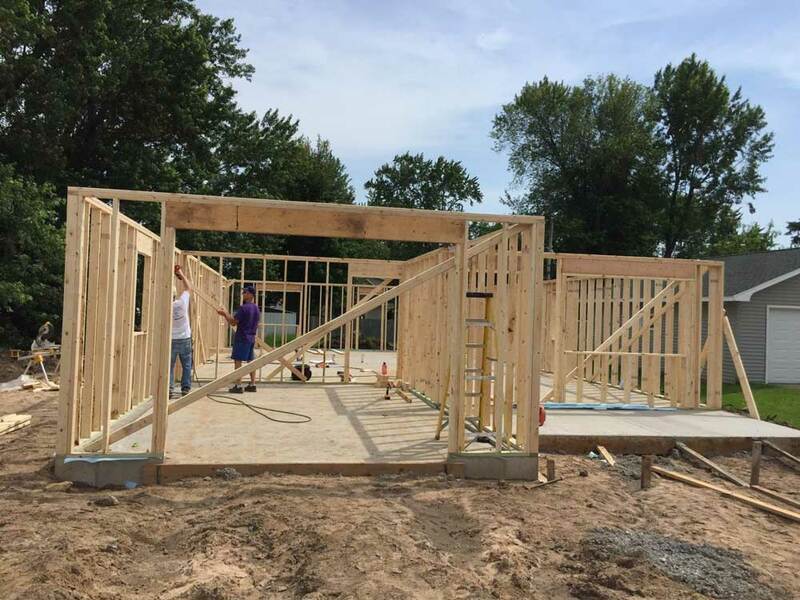 …….kept hammering away at it…..and by the end of the day all the exterior walls were up. What a great start! 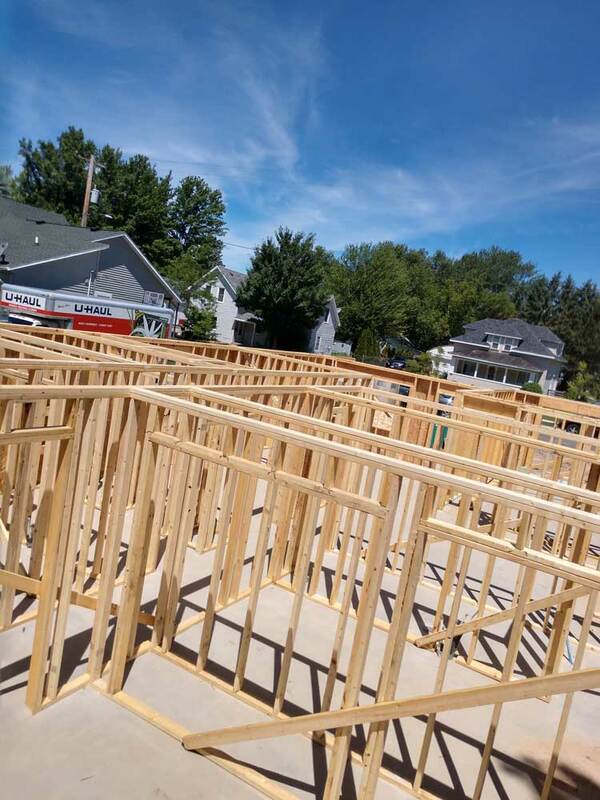 and got all the OSB and foam on….awaiting the installation of the trusses on Thursday. 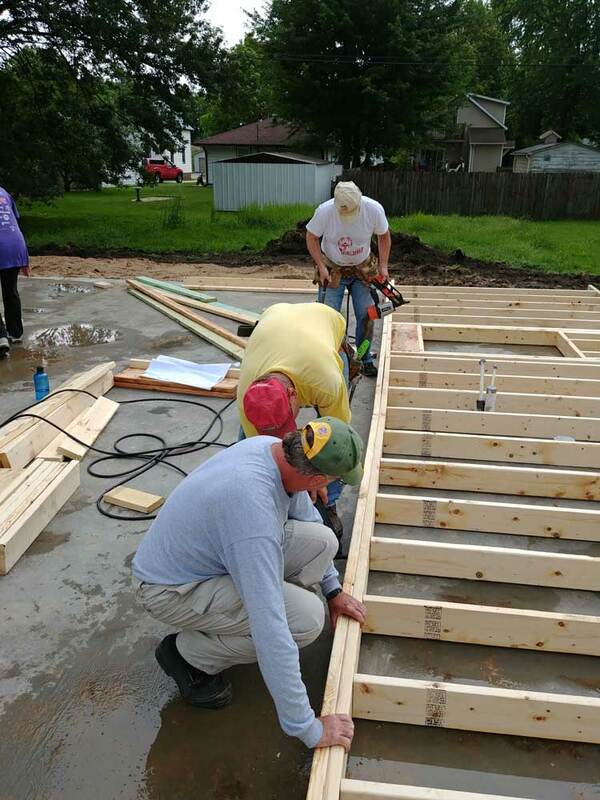 Thursday and Friday (June 28, 29) we had a crane from Ellis Construction, and a crew from Heartland Custom Homes volunteering and the trusses, sheeting and roofing felt were completed. WOW! Great work, thank you! While construction of our new home has been going great guns……thanks Brian and all the gang……our web-master has not. 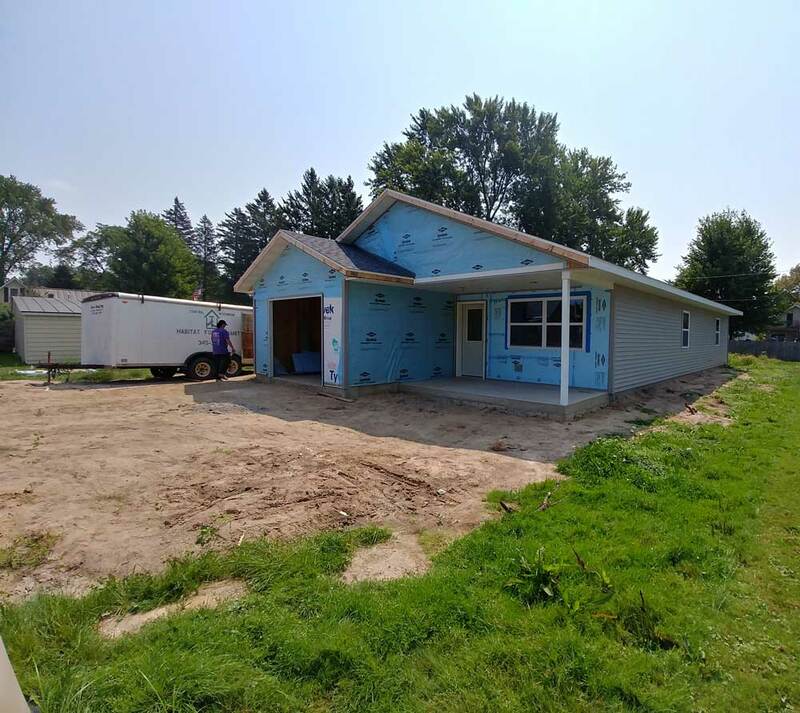 To get us up to speed as of today, roof on, windows and doors in, most of siding done, wires pulled……and ready for insulation. 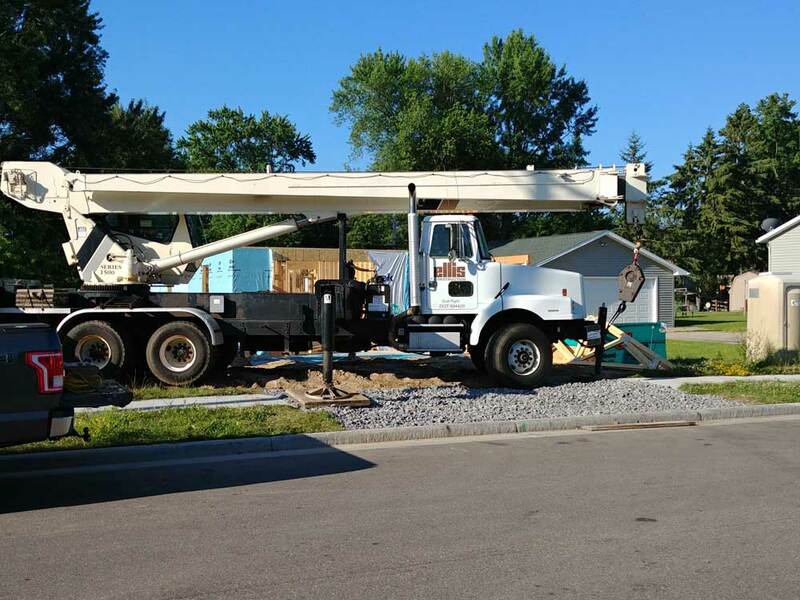 And…..drywall in a couple weeks. 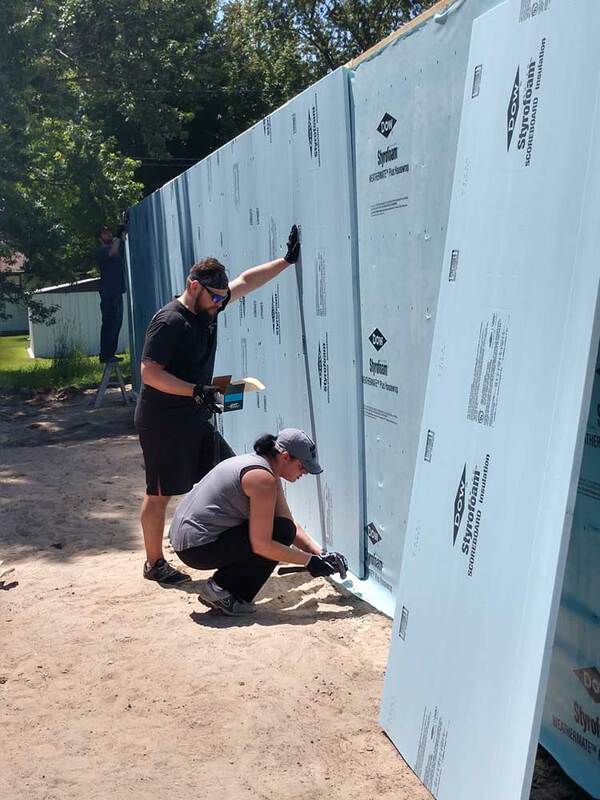 All the wall insulation was placed along with the wall vapor barrier. Looks like drywall is going up this week Friday and Saturday! The drywall was delivered this week, and with a little grunting and groaning (and with the help of a couple guys from Heartland Custom Homes) we got it dragged inside. Friday and Saturday all the ceilings and almost half the walls were drywalled. Great work crew!! All the dry wall (except in the garage) is up and ready for the finisher. Also the siding was completed this weekend. We hope to finish the garage this week. 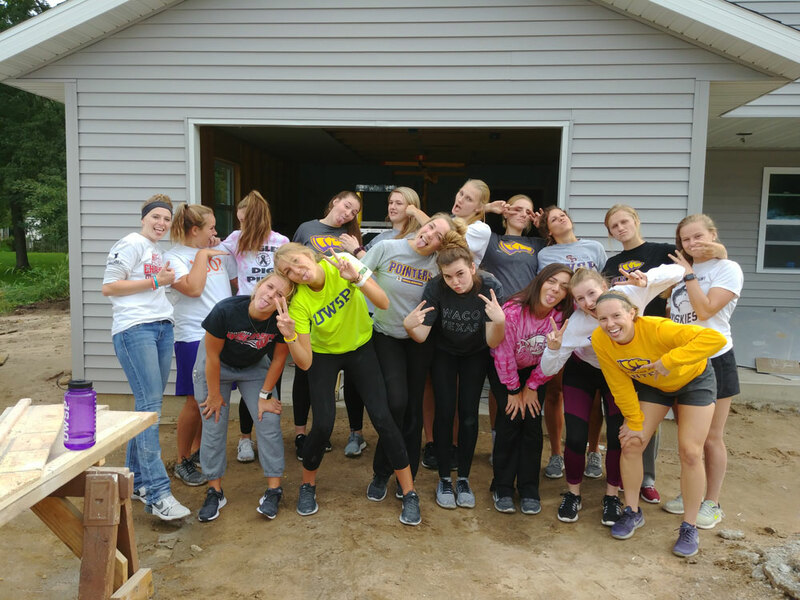 A big thanks to the UWSP Women’s Basket Ball Team along with Coach Shirley Egner and Coach Diane Gilbert for helping on Friday. 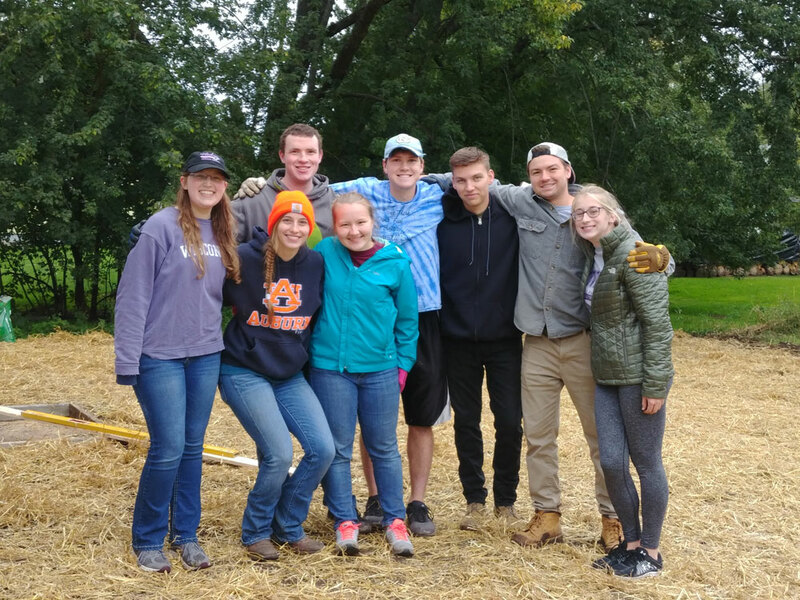 The Team has volunteered each fall for over 20 years and we appreciate their enthusiastic support. Tuesday of this week we installed some flooring and the kitchen cabinets and bathroom vanities. 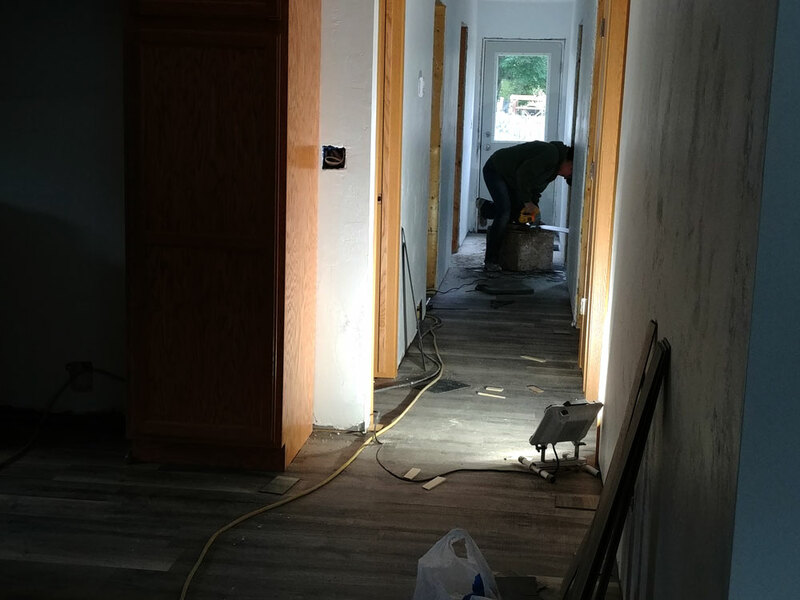 Friday and Saturday we continued with flooring, doors and casing. 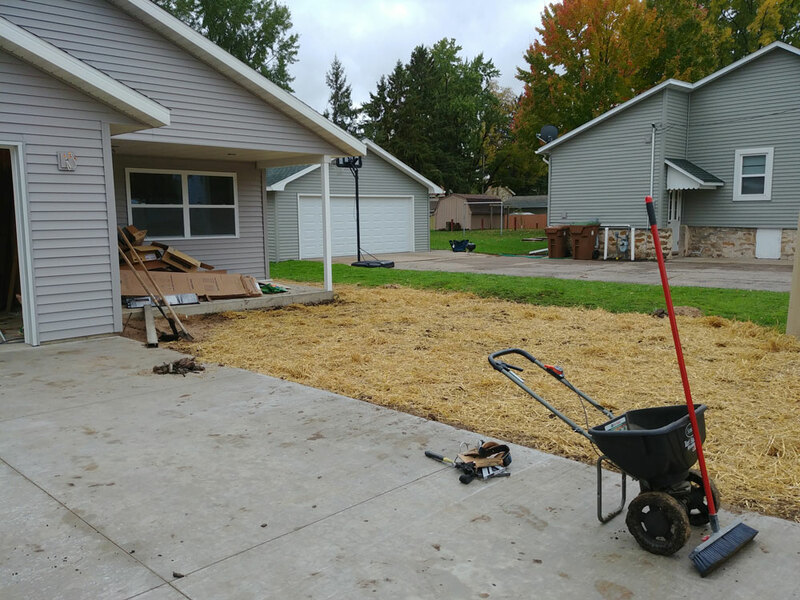 Also on Saturday thanks to a hard working group from the UWSP Habitat Chapter over half of the lawn was seeded. Thank you Campus Chapter! 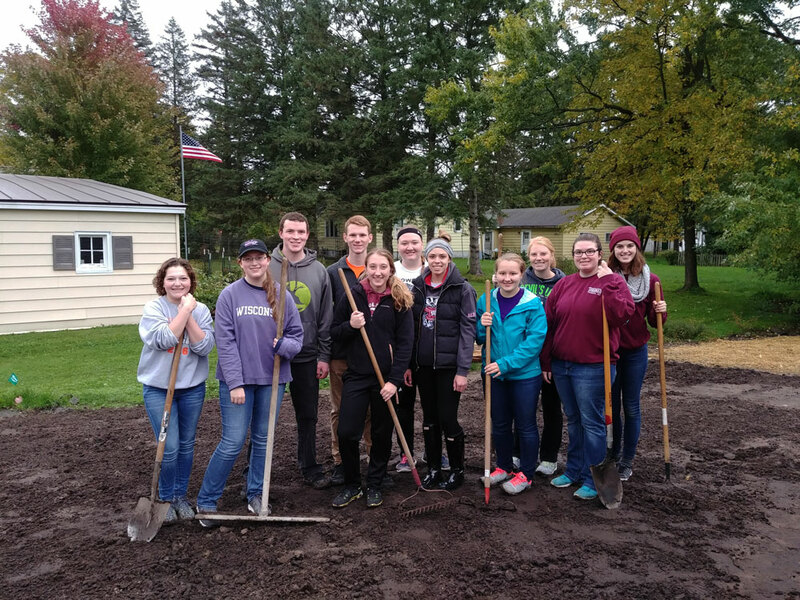 The UWSP Campus Chapter was back at it Saturday and finished the landscaping. Thank you Campus Chapter…..that was hard work and it looks great! 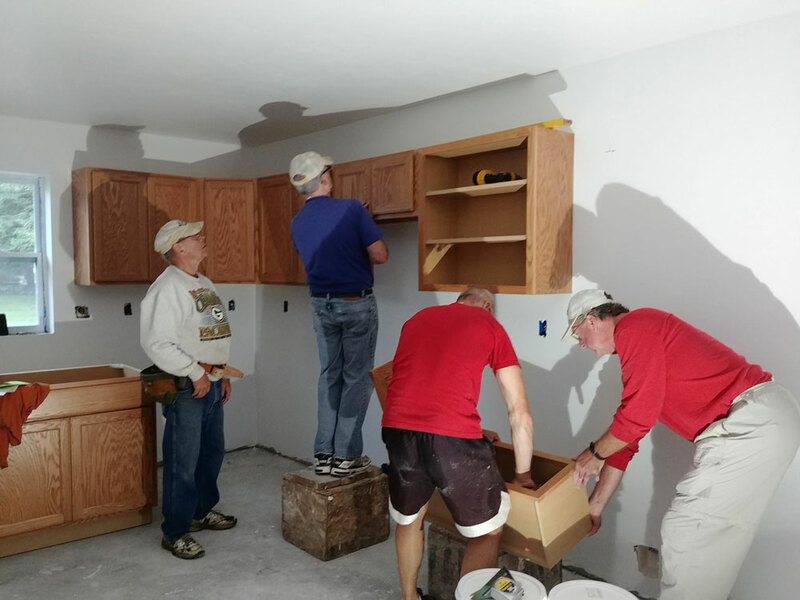 In addition to the students we had a great crew of volunteers in this weekend and installed all the counter tops, hung and cased the rest of the doors, put up towel bars, finished the flooring and finished baseboard. 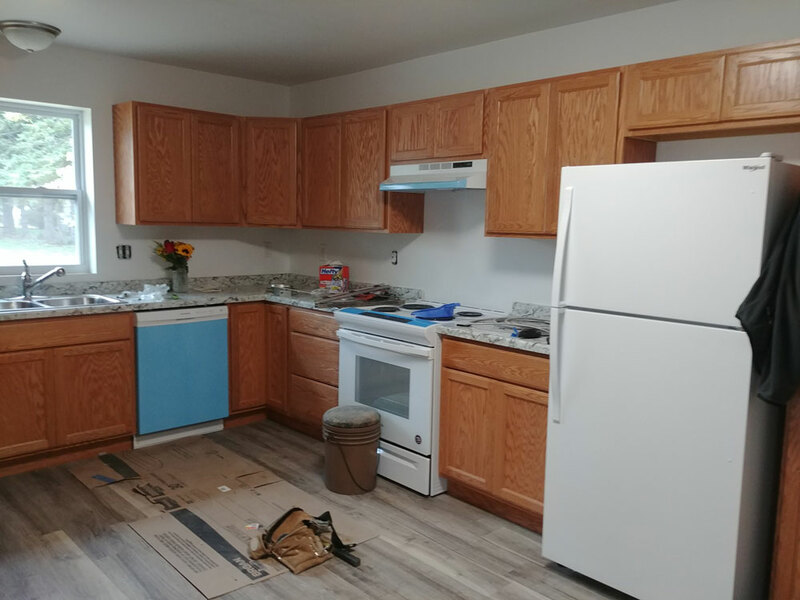 This coming weekend we will work on the closet shelving, caulking, sliding in the stove and fridge, installing a couple fixtures and the range hood. Pretty quick after that we will wrap it up. We finished the closets, hung the mirrors, installed the range hood, completed the caulking and placed the fridge and stove this weekend. All that is left is to install window sills, flooring transition strips and having the electrician finish up. We will be moving our family in soon!